g131 | balking off . . .
Kuma started out great – striking out the side in the 1st but then, threw a TON of pitches as he struggled through the 2nd (giving up TWO runs to tie the game in the process). But, he settled down and retired NINE straight at one point, ending with . . . Missed most of the game but, saw a really bizarre 10th inning with Danny pitching . . .
No way. A balk for the go ahead run in the 10th? I've seen it all now. Farquhar said he didn't feel himself flinch, but said he saw it on video. Called it slight. g126 | series win against the ‘phants! Kuma gave up TWO lead-off homers but, posted his second straight solid outing to earn his TWELFTH victory . . .
Each team had SEVEN hits (including TWO doubles and ONE homer – the A’s also has a triple) but . .
~ Brendan (in for Nick who’s still nursing a stitched up knee) hit a TWO-run double that gave the M’s the 4-3 lead in the 6th and then he added an RBI single to extend their lead to 5-3 in the 8th. Not a happy Felix day to say the least ~ especially the 2nd inning ~ FIVE’s nearly across the board in a BAD way . . . Believe it or not, the M’s were actually in this game until the 7th, having scored ONE run in each of the first THREE innings. And then a pretty improbable 6th . . . Luke loaded the bases (an error by Brendan, a single and a HBP) and Carter came in and was indeed impressive, retiring the side in order without giving up a run! TEN hits usually good, right? Especially with a couple of doubles (Brad and Raul) and a home run (Kyle) and THREE players with multiple hits. Perez and Furbush combined to throw 61 pitches in that eighth inning. With 5 in, Felix has equaled the most runs he has given up in an inning this year. 6 is his career high. Jurickson Profar now has one more stolen base than I do. g117 | The King, The Lord The DEE and the bottom of the order . . .
A VERY Happy Felix Day, as Felix was Felix, the DEE was back “on” and the O was just enough. THIS is the Felix we know and love – maybe not perfect but, definitely dominant . . .
Aaron looked to follow up his great start in Cinci with another but, ‘t was not to be . . .
1st inning went well, with the aid of a DP. The 2nd inning could have been MUCH worse, as the loaded the bases with NO outs (including a double by Ortiz that gave him the all time DH hits record – 1689) but they only managed a couple of sac-flys. And, it just escalated from there . . .
} Lucas, the only pitcher with a decent outing last night, did not help matters in relief of Aaron on this night, giving up a couple of inherited runners and then another of his own.
} Tom walked the first two batters and allowed ONE run on a WP and another on a one-out single (to Mike Carp). He ended up striking out TWO on (sheer anger). Ortiz just set the MLB record for most hits by a DH 1689 and gets a huge ovation from the crowd at Safeco which he acknowledges. g72 | a WIN? in Anaheim? in extras? 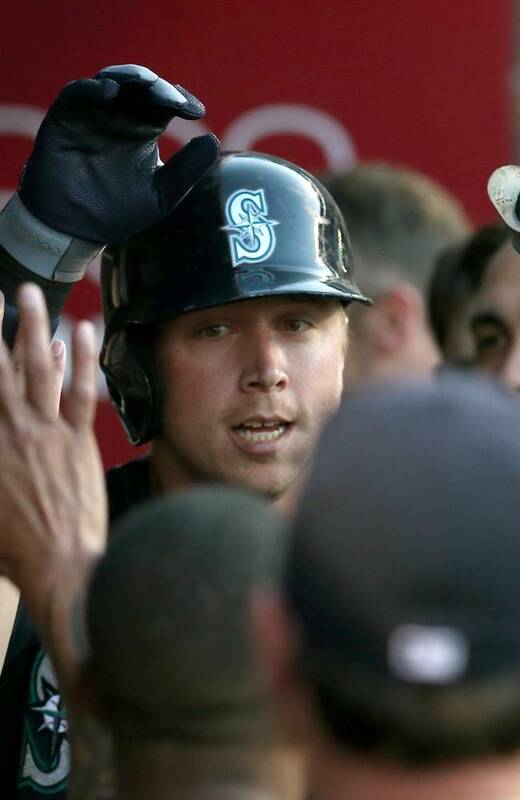 Earlier today, it was announced that Alex Liddi was optioned to AAA Tacoma and Justin Smoak was activated from the DL (after a rehab stint with the Rainiers). ‘t was a short trip for Justin to Oakland, as the Rainiers had been in Sacramento. Really a shame that Jeremy didn’t get the win tonight, after putting up his THIRD straight quality start (allowed just ONE run in his TWO previous starts: a win vs. the Yanks in SIX innings, a ND vs. the ‘stros in EIGHT innings). His final line . . .
} Ollie in for the 7th . . .
walked the lead batter (Ianetta), got Bourjos to fly out, then a WP advanced the runner to 2B, he then got Trout looking and Hamilton swinging.
} Tom in for the 8th . . .
boom. lead-off homer by Pujols ties the ball game (believe it or not, it was the first homer Tom gave up this season). The good news is he was able to retire the rest in order AND then come back out for the 9th where he gave up a lead-off base hit, a wild pitch and a walk BUT, got Bourjos to strikeout and Trout to fly out. There’s nothing wrong with Tom’s velocity (touched 97-98 a couple times) it’s just a matter of location and confidence and, despite the homer, the fact that he hung in and got some outs after that, is a means toward that end.
} Yoervis in for the 10th . . .
gets Pujols to pop-up behind the plate, Trumbo to strike out and Kendrick to ground out to earn his FIRST career SAVE . . .
~ back-to-back jacks from Rauuuuuuul and Justin on back-to-back pitches in the 2nd gave the M’s a 2-0 lead . . .
~ Kyle hits a TWO-out double in the 10th and scores the go-ahead run via Kendrys FIRST hit of the night (what would end up being his NINTH game-winning hit of the season)! Bonderman's scoreless inning streak ends at 14 as Trumbo takes him deep leading off second. interesting note of the game . . .